The League of Extraordinary Gentlemen The League LXG The League of Extraordinary Gentlemen was one of those summer movies that I was eagerly anticipating. I didn’t really have high hopes, even though I’d always found the idea to be exceptional. In fact, after hearing rampant rumors of on set fights between star Sean Connery and director Stephen Norrington, I had a sneaking suspicion that The League of Extraordinary Gentlemen was going to be a train wreck of epic proportions not seen since Battlefield Earth. Trailers and commercials for the film did very little to convince me that this feeling of misgiving was out of line. But that was okay with me, because by this point, I had disabused myself of the notion that this movie had any hope of being good, and instead decided to instead look forward to the convoluted mess that was likely to be the final product. Unfortunately, I didn’t lower my expectations nearly close to enough. Yes, The League of Extraordinary Gentlemen is a movie so horrifically bad and offensive to the senses that even Joel and the ‘bots would have a hard time finding any redeeming value in it. Every single person involved with this odious project will need to buy me numerous trinkets, video games, and a beach house in Key Largo before I’ll forgive them enough to see any of their future films ever again. Before the movie even gets going, it’s easy to tell that it’s going to be one of those pictures that saved money on budget by filming entirely during the late evening hours. Everything is dark – and I’m not talking dark atmospherically, I mean that it’s literally so black that it’s frequently impossible to determine what’s happening. Since the story is so ridiculously nonsensical as to be incomprehensible, any additional confusion is a very bad thing. Part of the reason that director Stephen Norrington (memo to Steve: I hate you so very much) may have chosen to keep everything so murky is to hide the preposterously poor special effects. In fact, I believe I owe The Hulk an apology for my criticisms of its bad CGI, as The League of Extraordinary Gentlemen has visuals that look as though they might have been lifted from Attack of the Giant Leeches or possibly even that 1987 classic The Gate (if you don’t remember this film, Stephen Dorff’s memory ray has been more successful than previously assumed). Sadly, these fake CGI performers (such as Mr. Hyde) were actually far superior to their real-life, human counterparts. There are simply too many characters involved in the story to allow any one person to stand out from the fray. From what I can tell, Connery had every right to want to punch his director, as his Allan Quatermain (don't look too closely at his family tombstones because it's spelled wrong in the film) is basically good for nothing save acting chauvinistic and bolstering recruits for the NRA. Perhaps if they had been fleshed out, Mina Harker (Peta Wilson) and Invisible Man Rodney Skinner (Tony Curran) might have been fascinating and enduring cinematic characters; unfortunately, neither one gets enough screen time to make a truly lasting impression. Both were adequate within the rather strict confines of their narrow roles, but given their limitations, neither one has much bite (pardon the pun). Naseeruddin Shah was a stoic Captain Nemo, but again, the mysterious background of the character is never explained (though readers of Jules Verne novels will be familiar with his past) and those missing pieces mean that his motivation to redeem himself isn’t that believable. The remaining “major” actors are all unpardonably dreadful. Shane West is terribly out of place as the lone American amongst the group, a grown-up version of Tom Sawyer. I’m guessing that the fact that the bulk of Connery’s scenes heavily involved this young actor was the impetus for a lot of the elder statesman’s ire. Worse yet is Jason Flemyng as Dr. Henry Jekyll – basically, his approach to the character is to act a lot like Crispin Glover in Willard…or Charlie’s Angels…or anything else that features a creepy, strung-out freak. Stuart Townsend must be kicking himself over and over and over again for whatever it was he did to Peter Jackson that got him booted as Aragorn from the Lord of the Rings films. Or perhaps his idea of penitence is to do time in LXG as the insufferable Dorian Grey, who at least was somewhat true to his literary roots in the film. Townsend’s acting was so poor that it gave away every single twist and turn that eventually took place in the film. Alas, I’m not even exaggerating for effect. Finally, we have Richard Roxburgh, everyone’s favorite Duke from Moulin Rouge. He portrays the mysterious “M,” the man who assembles the league to prevent a World War. Of course, as viewers of the film, we know that said World War still takes place a mere 15 years after events in this film take place, so the whole thing appears to be quite an exercise in futility. The League of Extraordinary Gentlemen does have some villains; however, to reveal their identity would be to ruin what little story exists. Let’s just say that their motivations are questionable, if not perplexing. Additionally, it is difficult to tell the bad guys apart at times, though I think that’s due to poor editing more than anything. As far as story goes, it seems to have been made up as they went along, despite the fact that the screenplay is supposed to be based on a very well regarded comic book by Alan Moore and Kevin O’Neill. If you’re looking for the logic or elegance that you might have come to expect with these classic literary characters, forget it. And if you’re unfamiliar with any of their backgrounds, prepare to be baffled. In fact, even if you do know something about the history of the likes of Mina Harker, Dorian Gray and Tom Sawyer, there’s very little here that makes any kind of logical sense. The real fault for the film’s substantial failure pretty clearly lies squarely on the shoulders of director Norrington. 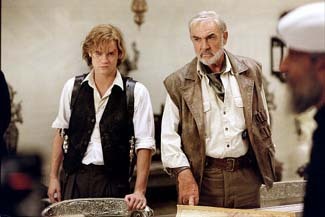 I do believe that the concept itself is fantastic, but whether due to scenes left on the editing floor, poor casting decisions or just a plain lack of understanding, The League of Extraordinary Gentlemen resorts to every cliché in the book, from evilly laughing villain to a denouement that obviously sets up a sequel. I’d like to end this cautionary tale by noting that The League of Extraordinary Gentlemen clocks in at 110 minutes, but it feels closer to two days. The best advice I can give is that if you do ignore me and punish yourself by viewing this atrocity, ease the pain by then going to the next theater and watching Pirates of the Caribbean, which really defines everything a summer movie should be.